A great announcement was made today by renowned sports superstar Cristiano Ronaldo and his nutrition backer, Herbalife - a groundbreaking sports drink targeting professional athletes and sports hobbyists - CR7 Drive. In a press conference, the team presented their new product to an eager public. Herbalife is responsible of Ronaldo's daily health needs, and the awesome product is the result of the long standing common partnership between the two sides, and is a showpiece of the excellent work they have done hand in hand. Herbalife has been dedicated to the player both on and off the pitch as part of its multi-year deal with Ronaldo, and CR7 Drive was designed to optimize his abilities and handle his individual nutritional needs. 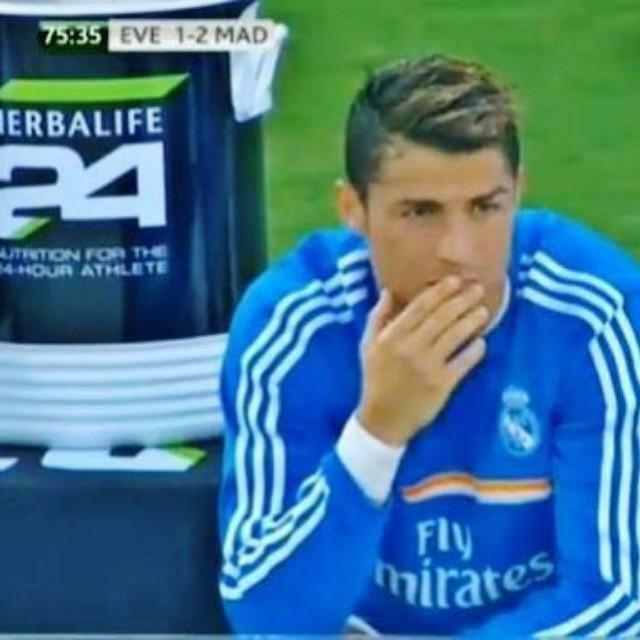 "Cristiano Ronaldo takes vitamins and minerals very seriously and acknowledges how a suitable diet in combination with select nutrients can help to bolster his abilities," said Michael Johnson, chairman and CEO, Herbalife. This excellent new energy drink was initially planned for the requirements of Ronaldo, but in fact the requirements of athletes throughout the world are much the same - be they professionals or hobbyists. It is an incredible pleasure for Herbalife to be in a position to make such a supplement available to sports people everywhere. Both sides are very pleased with their mutual efforts with each other, with Ronaldo stating that he appreciates how seriously Herbalife takes nutrition, and Herbalife indicating their amazement at the devotion and professionalism of the football player. CR7 Drive is a advanced take on traditional sports drinks, without any synthetic flavors or sweeteners. The answer is in the extra carbohydrates that can provide additional energy for exercise, and more supplements that replace the key compounds the body consumes through sweating. It is a great supplement for a wide selection of activities, such as football, MMA, boxing, running... any exercise that makes you move and your heart beat faster. Like all the supplements that are a part of the Herbalife 24 range, it has been substantially analyzed for banned chemicals and satisfies all the essential nutritional standards and manufacturing standards. A devoted team of researchers and doctors work each day with the football star to help him get the ideal nutrition every day, and many of the finest nutritionists in the world provide him with constant information and suggestions on how he can improve his abilities with proper dietary supplements. Out of this partnership, the new supplement, CR7 Drive, was crafted. Herbalife is an international nutrition company that has been changing people's lives with great solutions since 1980. The corporation is most popular for its weight reducing solutions and products, but has also developed a whole assortment of items that help with personal and skin care, sports performance and energy levels. All services are obtainable only through skilled Herbalife members, in more than 90 international locations around the world. They are devoted to fighting the worldwide problems of poor nutrition and excessive weight by offering high-quality products and solutions, one-on-one mentoring with an Herbalife member and a group that inspires buyers to live a healthy, active life. They maintain the Herbalife Family Foundation (HFF) and its Casa Herbalife programs to help bring good nourishment to young ones in need. Many of the planet's foremost athletes and sports clubs use Herbalife products to help their members achieve the top results in their individual fields. Almost 8000 individuals are regularly employed by Herbalife, and its stock is traded on the NYSE, with a turnover of USD 5 billion in 2014. It is a great recognition for any athlete to be known in their profession, but only very few ever break out of this and become real legends popular everywhere around the world. Since his initial days as a rising star with Sporting Lisbon, to his status as a multiple World Player of the Year, Ronaldo has received more trophies, plaudits and records than many players struggle to imagine. And he displays no indications of slowing down. His amazing pace, power and predatory sense for scoring have made him the ideal modern football player. Nevertheless, this international success has come at the cost of much difficulty. At a young age, he left his family's humble residence in Madeira to pursue his desire of becoming a professional footballer with Sporting Lisbon. In record time, his potential was seen by managers all over the world, and followers loved seeing his lightning speed and breathtaking dribbling that was lighting stadiums on fire. A great supporter of Ronaldo was the celebrated Manchester United football team, who brought him over to the UK in 2003. Under the excellent manager's tutelage, Ronaldo honed his natural ability to become a world-beater. He was responsible for 110 goals in his 6 years in Manchester, and won an amazing 9 UK and Continental titles. With his participation, Man Utd became the best team of that period. He also had the recognition of being the head of his national team, and was selected as captain. He smashed the worldwide transfer record when he moved to Madrid. Since then, he has become a legend of Madrid, a team that is always home to some of the sport's best players. He is the only player to be named World Player of the year on three separate occasions, is the best scorer in the history of the Champions league, the top scorer in the history of Real Madrid and has won innumerable titles in all the contests he has played. The only person in football to have won the prize for most goals in Europe on four instances is our very own Herbalife competitor - Ronaldo!